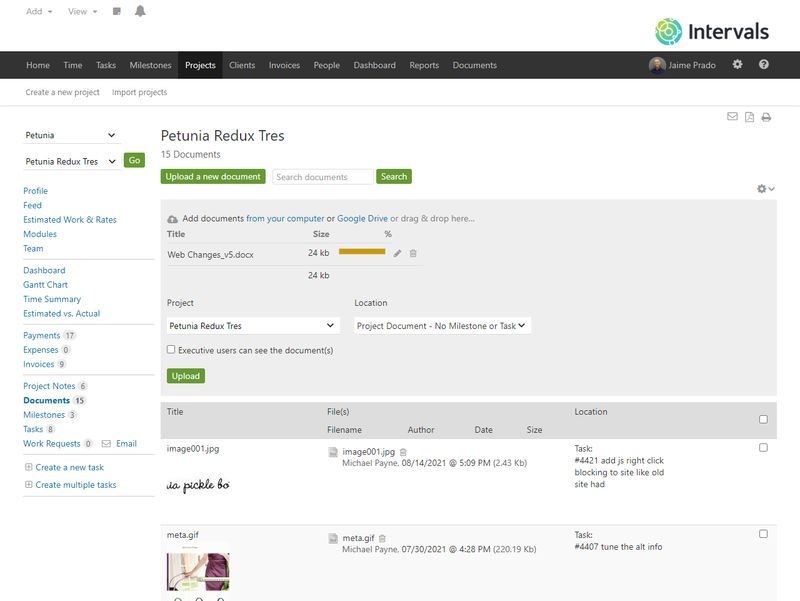 Intervals project management software with document sharing allows you to upload documents from your computer or Google Drive and share them with your team. Simply drag and drop them onto the documents tab or the documents section of any project, milestone, or task. With Intervals you can attach any type of file directly to a project, milestone, or task, so your team doesn’t have to go looking for it. When collaborating online with others on projects and tasks, most descriptions of work need more than just words. Additional files, like spreadsheets, diagrams, and photos are often times required to communicate. Intervals features flexible online document sharing to make your project and task management workflows complete. Files are accessible at any time, from anywhere. Constantly updating the same file? 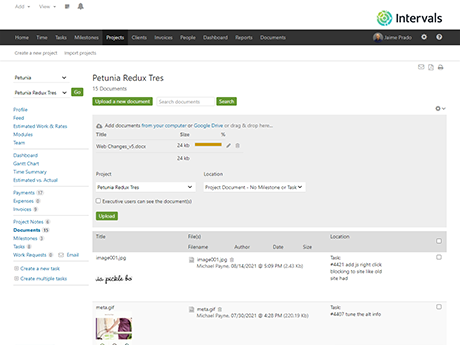 Intervals versions your files so you can track iterations over time. Don’t like the latest evolution? The online document storage feature allows you to quickly download a previous version with just one click. What types of files can you upload? Contracts, logos, screenshots, design comps, spreadsheets, copy, photos, work requests — there are no file type restrictions. Upload whatever you need to get your work done. For additional ease of mind, all documents are encrypted and backed up to redundant servers. Keep all of your files the same place where you manage the work.